First published in Steven's Window, column of The National newspaper of PNG. Friday 15th, 2010. 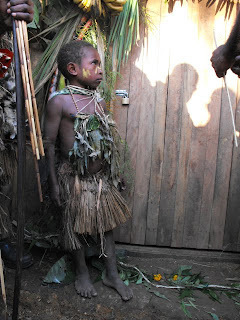 A young guard of cultural traditions in front of Ayugham Bana cultural centre, Aiyura valley, EHP, PNG. Photo: Keisiva Darius. Two places I am fond of visiting every time I travel overseas are the museums and bookshops. In museums I get a rare glimpse of a place, a people, a culture, and lifestyles as preserved by the curators and museum workers. It is also a place that a society makes a point about itself. The way a museum is organised, structured, and arranged is the way in which a particular society sees itself in relation to its objects of cultural value. There are many stories and narratives written, painted, printed and displayed in the halls of a museum. I sometimes spend hours walking in the carefully structured hallways to view and learn about a society. In his introduction to the book Museum Provision and Professionalism, Gaynor Kavanagh says “museums differ across time and across cultures. Cultural and political differences will also make themselves evident in the form the museum takes and the priorities adopted. We invest our own culture in the institutions we create. A museum in, say, the West Midlands, in the United Kingdom, will have a different range of characteristics to one in central Sweden, northern France, California, the Ukraine or the suburbs of Sydney. Should you visit them, you would spot the differences instantly, although sometimes they are difficult to put into words” (1994: 3). The museums that I have visited include the Chicago Field Museum in Illinois, Minneapolis Institute of Art in Minnesota, USA, Australian National Museum in Sydney, Te Papa in Wellington, and the Canterbury Museum in New Zealand. In the Minneapolis Institute of Arts I spend a whole semester studying how the Foucauldian notions of power and space are organized in a museum. The Minneapolis Institute of Arts hosts one of the rare collections of Malagan artefacts. In Te Papa Museum, I learnt that eels are migrational around the South Pacific rather than being static in one place. In the Chicago Field Museum, a Murik Tumbuan guards one corner of the main hall. Canterbury Museum, located in Christchurch, New Zealand hosts its original collection as well as travelling exhibits. One year, a section was devoted to the Antartica Field Research Station. Among its original collections is the exhibition of Polynesian canoes, among which is a canoe from the Solomon Islands. Just before I left Christchurch in August 2006, the Canterbury Museum staffs, together with the staff of the Macmillan Brown Centre for Pacific Studies at the University of Canterbury, worked on a small exhibition featuring the collection of Macmillan Brown during his visits to the Pacific Islands in the early 1930s. Among the interesting items collected was a paddle from the Trobriand Islands. My reflection on the point about museums is that as institutions of cultural preservation and education many lessons are learnt from within its halls of knowledge. Museums serve as a place to preserve our past and a place where we can learn about ourselves. Our own National Museum and Art Gallery is an important space for public education and information dissemination. Consistent yearly activities should be scheduled and publicized for public visits and viewing. The importance of museums in contemporary Papua New Guineans’ lives must be set in motion. The museum must move away from the traditional role of being a house for preservation and housing old artefacts and rare traditional pieces of art and culture. The museum space must magnetize the public rather than keep them away from visiting it. It is time also, I suggest, the government build provincial museums and cultural centres to house, exhibit, and educate people about the heritage of a province. Each province can showcase their archaeological heritage, art, material culture, and living traditions in their own museums. The provincial museums can also be centres for art exhibitions and education centres for the people of the province and those who visit the province. It is the pride of each province to tell its own stories in the way they have developed from the prehistoric past to the present. One of the unique provincial museum is the J.K. McCarthy Museum in Kainantu. It was renamed as the Kainantu Cultural Centre. It has been in operation for 30 years. It attracts hundreds of tourists annually for its pottery, crafts, paintings, and other crafts. Unique to this centre is the pottery made from local clay unique to the area of Obura-Wanenara. The recent support it received from the Minister of Tourism, Arts and Culture, Honourable Charles Abel to keep its operations going is moral boosting for its patrons. In his article “A House of Thousand Cultural Societies” Michael Kisombo had written an informative piece on our National Museum and Art Gallery, (The National, September 4th, 2009) which readers can turn to for more information. I am also aware of plans to have a new museum developed in the near future to give it much needed attention in Papua New Guinea. The personal reflections made here serve to reinforce what was already stated by others for the sake of keeping alive the conversation on the provision of museum services and development of cultural centres in Papua New Guinea.